The University of Lincoln’s Isaac Newton Building, which has become home to thousands of scientists, engineers and mathematicians of the future, has been officially opened today (Thursday 19th October) by the UK’s most senior scientist, Professor Sir Mark Walport.Sir Mark, the Chief Executive Designate of UK Research and Innovation (UKRI), visited the University’s Brayford Campus as special guest at a ceremony marking the official opening of the major new science and engineering facility. As the new home of Lincoln’s Schools of Engineering, Computer Science, and Mathematics and Physics, and the base for the University’s growing strategic partnership with Siemens, the £28 million Isaac Newton Building represents a vibrant hub of academic teaching and learning, pioneering research, and collaboration with international industrial partners. Credit: Steve Smailes for The Lincolnite. The building – named after one of Lincolnshire’s most famous sons, the great 17th century mathematician and physicist who was born at Woolsthorpe-by-Colsterworth near Grantham, Lincolnshire – highlights the institution’s significant growth, support for industry, and commitment to the provision and advancement of key STEM subjects. 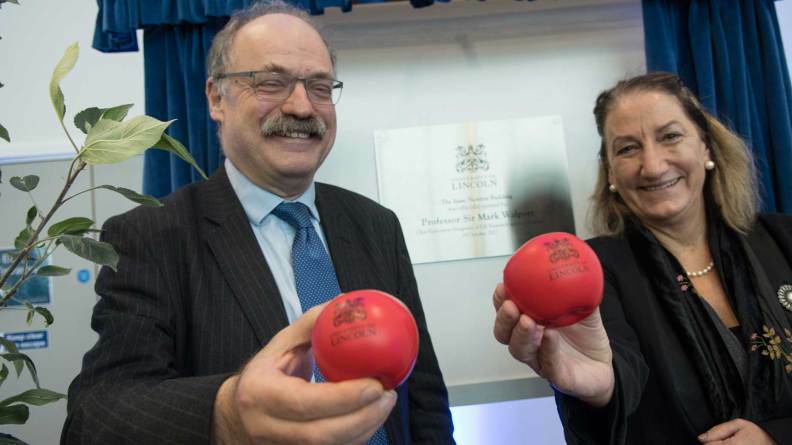 Sir Mark said: “It was an honour and a pleasure to open the Isaac Newton Building today. This splendid building brings together researchers from the Schools of Computer Science, Engineering, and Mathematics and Physics. It has been designed to foster collaboration between these disciplines – and importantly to bring in the arts and design skills of the University of Lincoln. Professor Mary Stuart, Vice Chancellor at the University of Lincoln, added: “The Isaac Newton Building represents the latest in a series of major new developments to support our growth in science and engineering capabilities. It shows what can be accomplished by listening and responding to the skills and innovation needs of industry, both locally and nationally, and we are grateful to our partners and our funders for the faith and vision they have shown in this endeavour over the past eight years. The building includes new teaching spaces, specialist robotics facilities, scientific laboratories and workshops, offices, and advanced research equipment. It also houses a 500-seat lecture theatre – the largest lecture theatre on campus – and a new café. With an overall internal area of approximately 7,000 square metres, the facility represents the largest building on the University’s Brayford Pool Campus. Professor Andrew Hunter, Deputy Vice Chancellor for Research and Innovation, said: “Over the last decade we have made major investments in science in the form of new buildings, courses and academic departments. The aim has been not only to offer new opportunities for students, but to provide the skills, expertise and facilities our region needs now and in future for economic success. We are already seeing the results, from award-winning industry collaborations to national excellence in teaching and world-leading research. The new building will ultimately provide a backdrop for an apple tree grown from a rare cutting taken from the tree which was thought to have inspired Sir Isaac Newton. The University of Lincoln was gifted a graft of the tree, from which it is reputed Newton saw an apple fall causing him to speculate upon the nature of gravitation during the ‘Year of Wonders’ (1665-66), when he achieved his most notable works. Since being donated to the University by Woolsthorpe Manor, which is managed by the National Trust, the cutting has been nurtured by scientists and once suitably mature will be planted next to the new Isaac Newton Building.